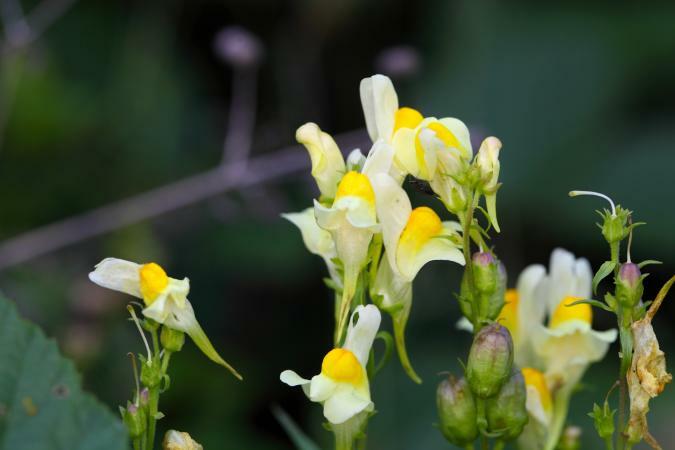 Toadflax (Linaria) - Includes some beautiful garden annuals and perennials, varying from dwarf alpines to tall, coarse plants. Alpine Toadflax (Linaria Alpina) - Forms dense, spreading, dwarf, and silvery tufts, covered with bluish-violet and intense orange flowers. It is usually biennial; but in favoured spots, both wild and cultivated, becomes perennial. It sows itself freely, being one of the most charming subjects that we can allow to "go wild" in sandy, gritty earth, or in chinks in the rock garden. It is found on moranies and in the debris of the Alps and Pyrenees. Linaria Antirrhinifolia - This elegant little rock plant forms a very neat spreading mass about 2 feet across, and about 6 to 8 inches high, and has the advantage of not spreading so rapidly as some of its congeners, and its bright purple flowers are produced incessantly during the summer and autumn. The plant is of the easiest possible culture, and can be highly recommended for the rock garden. Ivy-leaved Toadflax (Linaria Cymbalaria) - Often drapes walls in a graceful way, and is grown by cottagers as a window plant, a common name for it being "Mother of Thousands." A moist half-shady place best suits it, and the white variety is even prettier than the species. Linaria Dalmatica - A handsome plant, 3 to 5 feet high, much branched, and in summer has a profusion of large showy sulphur-yellow blossoms. It thrives best in warm places in light well-drained soil, and when once established can be eradicated with difficulty. Linaria Macedonica - A new and distinct plant, from 2 to 3 feet high, and throwing up shoots from the base. It differs from L. dalmatica in its broader leaves, and is quite hardy. Linaria Purpurea - A pretty kind with spikes of purple flowers, and one occasionally sees it on old walls, as it thrives well in dry spots. Linaria Triornithophora - A beautiful plant when well grown, 1 to 1 1/2 feet high, and with large purple long-spurred flowers in whorls of three. It is rather delicate and, though perennial, should be raised yearly from seed. Common Toadflax (Linaria Vulgaris) - Is very pretty as one sees it growing wild, but is also a good garden plant. The British variety Peloria is a handsome Toadflax, flowering freely after midsummer in a warm sunny border, and is effective in a mass. Here are a few other perennial Linarias that should be mentioned. L. hepaticaefolia (Hepatica-leaved Toadflax) is from Corsica, and is nearly always in flower in summer and autumn. L. saxatilis has dark brown and yellow flowers. L. anticaria is a good rock plant, forming little tufts and sowing itself freely. The finely-veined flowers are dull white tinged with lilac. L. pallida is a very dwarf pretty plant from Italy that flowers all summer. Some of the annual species of Toadflax are among our prettiest border flowers, growing about 1 foot high, and very effective in broad masses. Seed should be sown in ordinary garden soil in early spring, and the seedlings will flower in July and August. The following are some of the best varieties. L. reticulata has small purple flowers; the variety aureo-purpurea being a charming plant, with flowers which vary from rose-purple to dark orange. L. bipartita is also very variable, the colors ranging from deep purple to white. Perezi has small yellow flowers; whilst the flowers of maroccana vary from violet to pink. Those of multi-punctata, the dwarfest of the group, are black spotted with yellow. With so many varieties of Toadflax available, there's bound to be one that suits your growing conditions. Check your local nursery or garden center to see what's available.